I didn't prepare a study skin of a Northern Bobwhite this week at the museum. I worked on some other species that I'll be posting next week. I was over at my parents not too long ago, and they have a couple of stuffed bobwhites that used to belong to my nonno (or, if you're not Italian, grandfather) hanging on the wall, forever locked in flight . 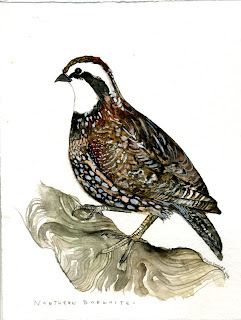 Nonno used to go hunting for bobwhite and Ring-necked pheasants, and my cousin in Michigan used to raise bobwhites. When we would go to visit my aunt, I would usually stay in the room that had the incubator for the bobwhites. At night I would fall asleep to their tiny peeps, and the glow of the incubator's light. My Nonno used to hunt out in Sugar Grove, IL with some good family friends, The Kovalicks. The Kovalicks ran a small, independent farm ( a rare breed these days). I spent a lot of time out on that farm growing up, and they were some of the hardest working people I have ever known. Since then, Sugar Grove has developed into a sprawling suburb, although a few of the farms (including the Kovalick's) still remain. Joe Kovalick died at the end of last year at the age of 89, and practically had a shovel and pitchfork in his hand right up until the end. I don't know anyone in my family that hunts now, but every time I look at those bobwhites on my parents wall, I think of my nonno, the Kovalicks, falling asleep to the sounds of tiny quail, and endless fields before they became condo complexes. No wonder this bobwhite is so gorgeous. You can tell a lot of love went into it :) Your nonno would be proud. Just checkin' out the blog today and dad and I had big smiles on our faces while reading your comments. We had forgotten about the incubator light. Nonno and Nonna would indeed be proud and this would bring a smile to Joe's face too(ed. commment - he was 89). Verrra nice!! whoops! i just changed it to 89. I finally subscribed to the blog so hopefully I won't miss any more posts. Like geninne said your talent is grand!